Truck driver Scott Shadwick is going much bigger than a pink ribbon to show support for cancer victims. 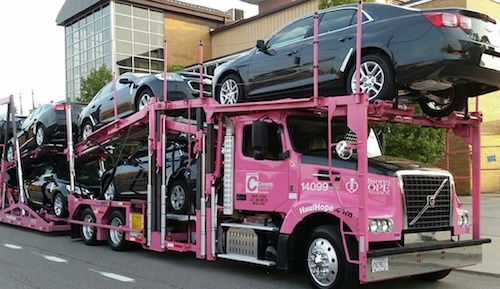 Instead he’s capturing attention on the nation's highways driving a huge pink truck as part of Cassens Transport Co.’s annual fundraising drive for cancer research and treatment. Shadwick says people can’t help but notice the truck and he’s getting lots of honks and waves. He’s also used to getting heckled by some passing motorists until they realize what the truck is for. 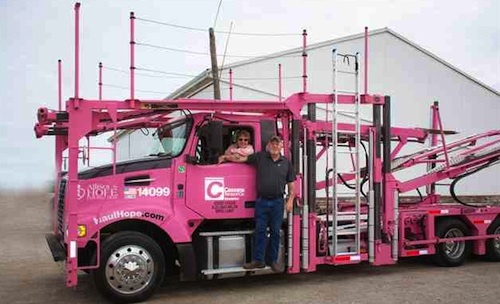 Cassens Transport Co.’s Haul Hope fundraiser has not only dedicated a rig to raise awareness, the company selects a group of long-haul drivers to take turns driving the signature pink truck if they or a loved one has had cancer. Shadwick started driving for the company in 1992 and his wife, Judi, was diagnosed with ovarian cancer in 1995. Although she ended up beating the cancer and is still alive today, Shadwick still remembers how traumatic the experience was after her diagnosis. They were raising a young daughter and son when she had to undergo chemotherapy. He says the experience gave him a real perspective on what cancer victims endure and he wants to do whatever he can to help others. “I thought it was an honor to be chosen by the company. It’s awesome that you’re driving for the cause,” he said. The Haul Hope fundraiser was started in 2007 by the auto transport company’s owners in honor of their daughter, Allison Cassens. The family lost her to cancer when she was only 33 years old. 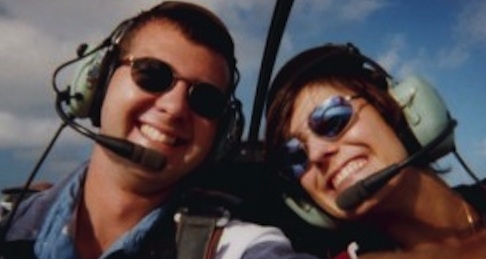 They established Allison’s HOPE, a non-profit group to honor her memory and to raise money for the world-renowned Dallas-based Mary Crowley Research Centers. Since 2004, the group has raised over $1 million. While they remain vigilant in the fight for cancer research, they’ve also been helping families affected by the burdens of cancer. “Our community has seen children, parents and grandparents fighting to keep their homes and food on the table while fighting for their lives,” said Adam Celuch, Allison’s HOPE marketing director. Shadwick has been driving the pink truck since the end of February and is slated to drive it until June 1. He said he still goes about the job the same way, making long haul deliveries and staying at motels along the way. The one big difference is that when he comes out in the morning, people will be crowded around the truck and sometimes posing for pictures with it. Of course he’s totally happy to see the pink rig getting all the attention and photo ops if it helps the cause. The painted truck is part of the fundraising campaign for the non-profit they established after the owner's daughter died of cancer. Have raised over $1 million for cancer research and struggling families over the last 10 years. Color pink Yes deyes were red for bravery .last dyes were pink . Today society sees them differently. Blessed are you. Thank you. That's great. Too many people suffer. It's nice seeing a company doing that. God Speed Love Home Amen..